Добрый день! Сегодня мы повторим Perfect tenses. Автор данного урока – Затонская А.С. Урок Perfect Tenses Revision направлен на повторение некоторых перфектных времен английского языка, а также на повторение лексики по теме Shopping. Вспомним вкратце правила употребления перфектных времен. Более подробно обо всех временах Perfect вы можете найти в следующих статьях. 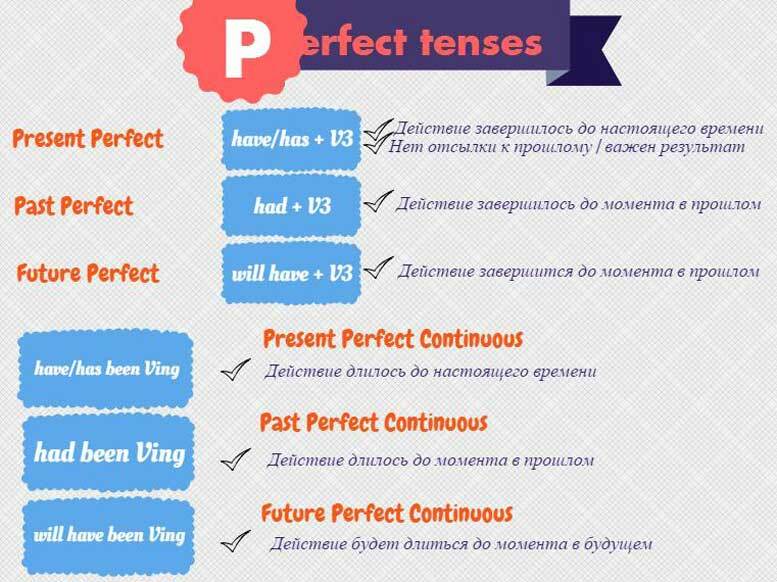 Переходим к упражнениям на отработку perfect tenses. 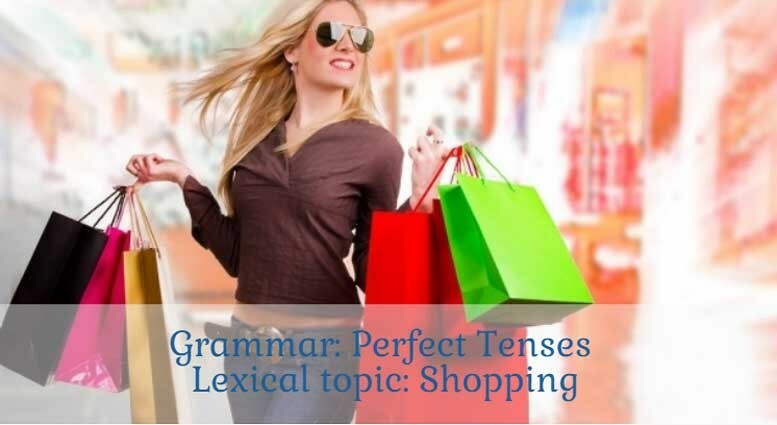 Grammar: Perfect Tenses (the Present Perfect Tense, the Present Perfect Continuous Tense, the Future Perfect Tense). Exercise 1. Choose the proper form of the verb. Do not forget to differentiate between the Present Perfect Tense and the Present Perfect Continuous Tense: you should you use the Present Perfect Tense when you want to underline the result of the action and/or to show its connection with the present; you use the Present Perfect Continuous Tense when you speak about the action which began in the past, lasted some time and is still going on at the present moment. Where is Jane? – She (has gone / has been going) shopping. She (has done / has been doing) shopping for three hours already. Where is Mary? – I (have asked / have been asking) her to buy some products. – So you want to say that she (has gone / has been going shopping) for two hours already?! – Why not? It is so in her character. Exercise 2. Translate into English. If you have any difficulties refer to exercise 1. Куда пропала Аня? Она где-то бродит уже два часа! – Мне кажется, она пошла купить чего-нибудь сладенького. – Ну, тогда все понятно: она такая сладкоежка, что может пропадать в кондитерских часами! Привет! Откуда ты? – Из магазина. – Купила что-нибудь? – Спортивный костюм – я с детства обожаю отдел спорттоваров. Представляешь, я только что встретила Лену на Большой Садовой! – Неужели она снова решила пройтись по магазинам? – Это еще мягко сказано: по ее словам, она ходит по магазинам с самого утра, обошла уже с дюжину магазинов и не собирается на этом останавливаться! – Ну что ж, вполне на нее похоже – она с детства была такой. Exercise 3. Imagine that you try to get the job of the shop-assistant manager. To get it you should not only be a good professional, tactful, attentive and aware of what is going on around in the shop; you should also know how to speak to people, for example – where to state a fact, and where to underline the result. Therefore you are given a test. The person who fulfils it first will get some privileges during the interview. Ex. 4. Open the brackets and put the verb in the proper Tense; if necessary, change the word order. Remember that in English you should underline different aspects of actions (fact, result, process) through using different Tenses. I (not / to go) yet shopping today, but I am just leaving. – You always (to say) that but I don’t remember that you (to do) ever what you promise. … you already (to finish) shopping today? – What are you talking about? I never (to think) about it! – Excuse me? – I (to buy) all the necessary products yesterday. – Oh, I see. … you already (to decide) what products you need to buy for your birthday party? – Not finally, but I (to buy) already everything necessary at the grocer’s, the butcher’s and the fishmonger’s. – Really? When … you (to do) that? – A day before yesterday. Look! I (to buy) just a new hat! Do you like it? – It’s wonderful. And I (to buy) new jeans a week ago. – Yes, I remember – I was with you when you (to try) them on. Mum, I must go – shut the door, please. – O.K. … you (to take) the shopping list? – And … you (to write) it? – Oh yes, I (to write) it even yesterday. Where … I (to put) it? Oh, here it is! Where is the shop assistant of this department? – I am sorry, he (to leave) just for a moment. He (to be back) in several minutes. You may go to the cashier not to lose your time. … you (to hear) that a new shop of knitted and leather goods was opened a week ago? – no, I … . …you (to be) there already? – Not yet. Are these the gloves you (to buy) this morning in the new shop? – On the contrary – these are my favorite gloves, and I (to buy) them a year ago and (to wear) since the whole winter. Besides, I (to be) in this new shop. Exercise 5. You are standing in a long queue. To entertain yourself you start reading anecdotes from the brochure you happen to have. Suddenly a brilliant idea occurs to you: if you translated them into English you would have something to entertain your tomorrow English-speaking guests. Джон, признавайся честно, кто написал тебе домашнее сочинение? – Честное слово, не знаю, сэр. Я рано лег спать вчера. У пьесы счастливый конец? – Да, все были счастливы, когда она закончилась. Один человек встретил другого в холле отеля. Он чувствовал, что знаком с этим человеком, но никак не мог вспомнить, где он с ним познакомился. Он подошел к человеку, протянул руку и сказал: “Я уверен, что где-то встречал вас” – “Без сомнения, я там часто бывал” – последовал ответ. Человек подходит к справочному окошку большого универмага: «Извините, я потерял жену» — «Все для похорон на третьем этаже». Exercise 6 Tell us about the things you have got on you now. Надеюсь, эти perfect tenses упражнения пришлись Вам по вкусу. На сайте grammar-tei.com есть больше упражнений на времена английского глагола. 2 Комментариев для "Perfect Tenses – Revision, Exercises"
Здравствуйте! а как же ответы?